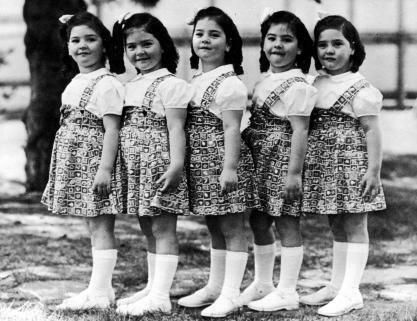 Dionne quintuplets, the five daughters—Émilie, Yvonne, Cécile, Marie, and Annette—born prematurely on May 28, 1934, near Callander, Ontario, Canada, to Oliva and Elzire Dionne. The parents had 14 children, 9 by single births. 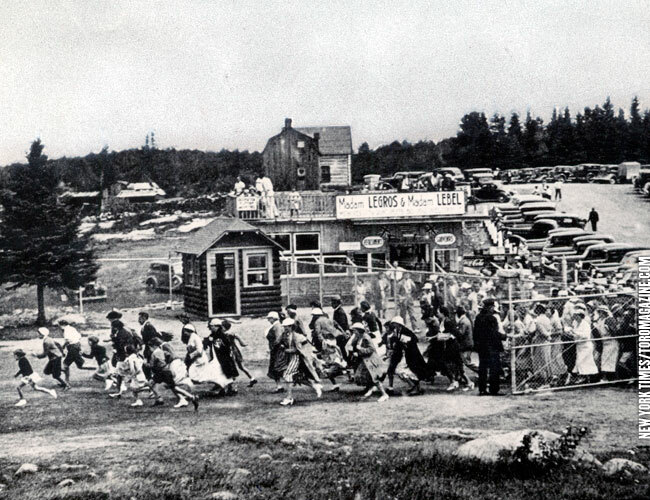 The quintuplets became international celebrities during their early years—making three feature films for Twentieth Century-Fox, providing profitable endorsements for products from cod-liver oil to typewriters and automobiles, and attracting hordes of tourists to northern Ontario. The attending physician, Allan Roy Dafoe (d. 1941), also became a celebrity. In 1935 Ontario made the quintuplets wards of the government, and Dafoe became their primary caretaker. 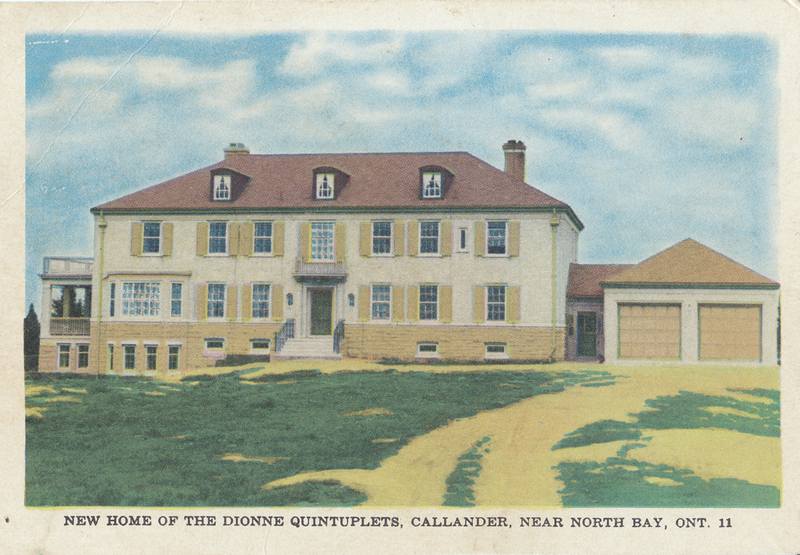 A hospital was built for them to live in, and “Quintland,” as it was known, became a popular tourist destination. Their father regained custody in 1941; in 1998 the sisters successfully sued the government for separating them from their parents. The Dionnes had five previous children, Ernest, Rose Marie, Thérèse, Daniel, and Pauline, who was only eleven months older than the quints. In total, the farming family consisted of ten children, five of whom were infants. The Dionnes also had three sons after the quintuplets: Oliva Jr., Victor and Claude. The five identical sisters were born from a single egg in 1934. They were abused for the beginning of their lives into their teenage years, both by the Ontario government and, they claim by their father. The news of the unusual birth spread quickly. Before long, people all over North America were offering assistance. Individuals sent supplies and well-meant advice and one hospital sent two incubators. 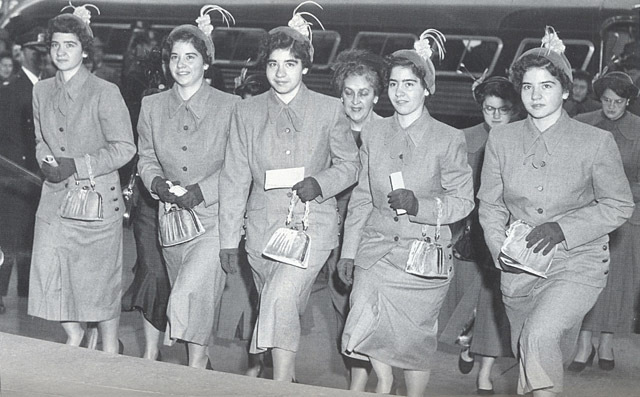 Oliva, already poor was approached by fair exhibitors for Chicago’s Century of Progress exhibition within days of their birth, who wished to put the Quintuplets on display. The parents were persuaded to agree, and although the contract was revoked before it was put into effect, it raised the issue of exploitation of the children. After four months with their family, the girls were made wards of the King for the next nine years under the Dionne Quintuplets’ Guardianship Act, 1935. In the same year the Ontario government had intervened and found the parents to be unfit for the quintuplets (although not for their previous children). The government recognized the massive public interest in the sisters and made them into a tourist attraction. Across the road from their birthplace, the Dafoe Hospital and Nursery was built for the five girls and their new caregivers. The compound had an outdoor playground designed to be a public observation area. It was surrounded by a covered arcade that allowed tourists to observe the sisters behind one-way screens. The girls were beautifully dressed, their hair curled, and they were provided with a plethora of toys. Meanwhile across the street their siblings, unnoticed by tourists and the media, lived in abject poverty. The quints were constantly tested, studied, and examined with records being taken of everything. The Dionne sisters, while living at the compound, had a somewhat rigid lifestyle. Cared for primarily by nurses, the children had limited exposure to the world outside the boundaries of the compound except for the daily rounds of tourists who, from the sisters’ point of view were heard but not seen. They also had occasional contact with their parents and siblings across the road. The quintuplets were allowed to leave the compound only a handful of times. Their parents were allowed to visit but to the girls they were simply two more visitors who had to wear surgical masks to keep from spreading germs. In November 1943, the Dionne parents won back custody of the sisters. The entire family moved into a newly built house within walking distance of Quintland. The yellow brick, 20-room mansion was paid for out of the Quintuplets’ fund. The home had many amenities of the time, including telephones, electricity and hot water. The mansion was nicknamed “The Big House.” The building is now a retirement home. While the parents claimed that they wished to integrate the quintuplets into the family, the sisters frequently travelled to perform at various functions, still dressed identically. According to the accounts of the surviving sisters, the parents often treated them at home as a five-part unit, and frequently lectured them about the trouble they had caused the family by existing. They were sometimes denied privileges the other children received, and were more strictly disciplined and punished. They also received a heavier share of the housework and farm work. They were unaware for many years that the lavish house, the expensive food and the series of cars the family enjoyed were paid for with money they themselves had earned. In particular, the father was resentful and suspicious of outsiders as a result of his having lost custody of his children. In 1995, the three surviving sisters asserted that their father had sexually abused them during their teenaged years. 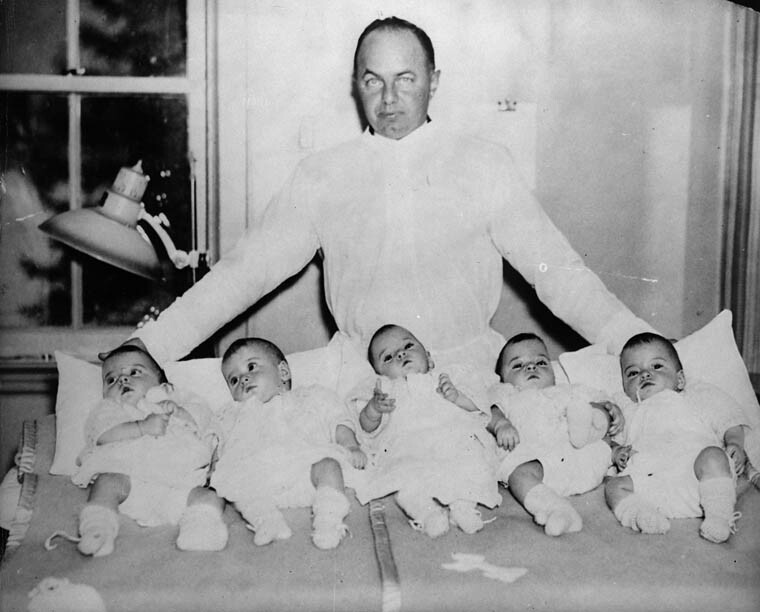 The quintuplets left the family home upon turning 18 years old in 1952, and had little contact with their parents afterwards. Marie went on to marry and have children — Cécile having twins Bruno and Bertrand. Yvonne and Émilie never married; Émilie devoted her brief life to becoming a nun. Yvonne finished nursing school—she turned to sculpting, and later she became a librarian. Cécile had five children, (one of whom died in infancy). Annette had three sons; Marie, two daughters. Émilie and Marie both died before reaching middle age, with Émilie dying as a result of a seizure at 20, and Marie dying at 35. Émilie had a series of seizures while she was a postulant at a convent. She had asked not to be left unattended, but the nun who was supposed to be watching her thought she was asleep and went to Mass. Émilie had another seizure, rolled onto her belly and, unable to raise her face from her pillow, accidentally suffocated. In 1970, Marie was living alone in an apartment and her sisters were worried, because they had not heard from her in several days. Her doctor, whom she was seeing at the time, went to her home and found her in bed. She had been dead for days. Her estranged husband quickly reported to the media that there had been a blood clot in her brain. Annette and Cécile both eventually divorced; by the 1990s, the three surviving sisters (Annette, Cécile and Yvonne) lived together in the Montreal suburb of Saint-Bruno-de-Montarville. They are the distant cousins of KREX-TV man, Maurice R. “Frenchie” Gagnon.